The above image is a scaled version of a larger image. Click the image above to obtain the full version (approx. 7.6 MB). 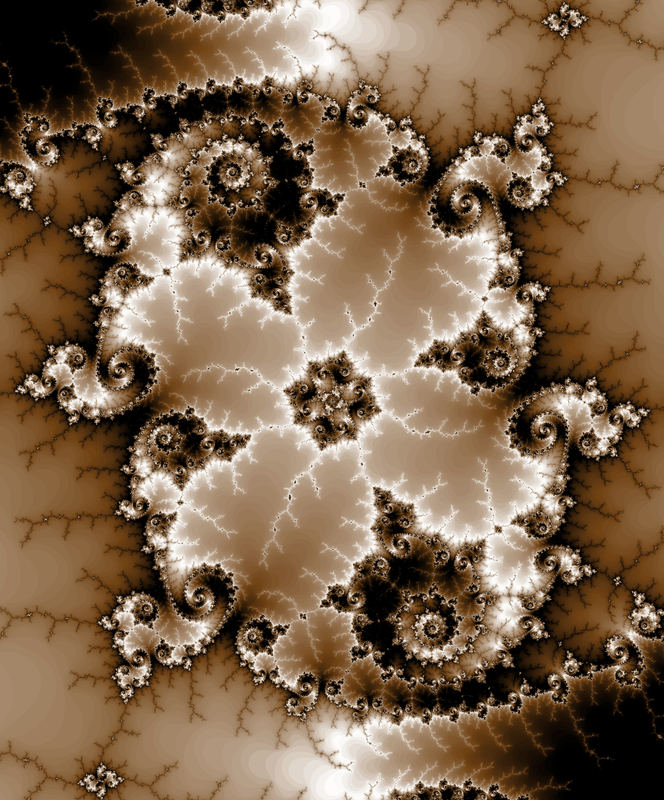 I have been interested in the Mandelbrot set for some time. I know how to create images using the standard escape time coloring scheme using MATLAB and compiled code, but I want to be able to create smoothly colored images. I get the impression from some of what I have read that it is not practically possible to make something that is truly smoothly colored, but I have seen images that are close. What I have read talks about a renormalized/normalized iteration count. However, I have been unable to implement this. I am a relatively proficient C programmer and I have access to MATLAB R2008a and Mathematica 7. Do you know how I might do this? And how do you create your images? With regard to coloring, the general idea is to treat the complex plane as a metric space. That is, from any point on the plane, we can measure the distance to another point. Specifically, we are interested in the distance from a particular point of interest to a point in the Mandelbrot set. One way to measure this distance is to count the number of iterations until the point “escapes” (i.e. the escape time algorithm). Other estimators of distance look at nth iteration and see where it ended up. The father from the set the nth term is, the greater the distance from the original point to the Mandelbrot set. These kinds of distance estimators should give a smoother coloring, though I am no expert. You may want to check out Coloring Dynamical Systems in the Complex Plane by Garcia et al. for further details. The discussion there seems relatively straightforward.